JK Imaging released Pixpro SP360 4K in 2016, the predecessor of its first 360° camera Pixpro SP360, which widens the field of view to 235 degrees and ups the resolution for better detail. If you are thinking to step ahead into Kodak 360 camera gear then it is good to go through its complete review for collecting useful information. 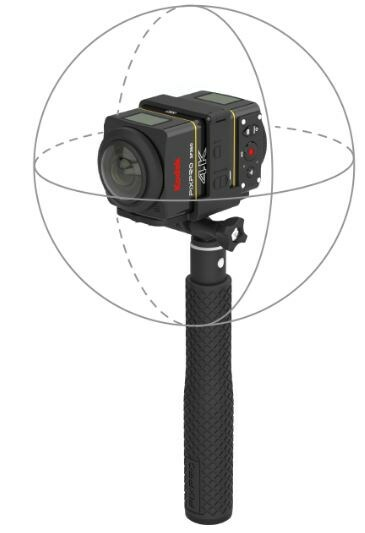 There are so many brands that are throwing all new stuff for 360 video recording and the market is flooded with huge competition where buyers feel confused about which one of these is good for them. 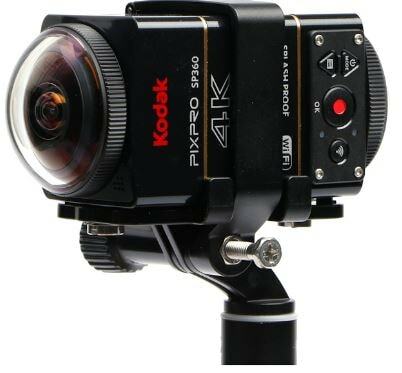 When we are more concerned with the quality of imaging, then the recent product from global licensee company Kodak cannot be ignored that comes with small size and attractive big fish eye type lenses where 360° view technique is followed to capture horizontal axis whereas vertical axis work upon 214 degree videos. This device is much better than its predecessor and you will be able to get immersive content with its deep picture details. Kodak has created a true wonder with designing of this 360° camera that has total dimensions of 1.9*2*2.1 inches and total weight goes up to 4.5 ounces. There are few on body type control buttons that serve for easy switching of camera and allows users to make selection between activation of Wi-Fi, start or stop recording, navigate menus, shooting mode as well as camera power on or off. The current shooting status will be available to users on a tiny monochrome type LCD panel connected on one side of the device. You will be able to increase stability in videos with its tripod mount facility, and the USB as well as micro HDMI type ports make connectivity much easier. Full charging can serve you for 55 minutes. This camera unit is well known for its abilities to capture videos in horizontal as well as vertical direction but you cannot use them both at a time; as it has limited controls on the panel, it appears to be a decent construction. Use the mode button to shift between different modes of operation and press exit option to get out of the menu. Actually, everything within this device is logically set that never creates any problem for users. For using your smartphone as like a remote control it is important to download Kodak app on your device and make its connectivity to the camera. The best thing to know about this camera unit is that it can click amazing pictures even when you are moving at a fast speed. That is why it is considered to be best choice for travelers and sports people. You can capture beautiful photographs and videos during bicycling as well as during family functions at home. The recording quality in case of Kodak unit is divided into two different sections as 16:9 and 1:1 so that users can have a variety of controls over content. The resolution modes are divided into 1080p and 4K shooting facility where videos are better controlled. Video stabilization is most appreciable in case of Kodak as compared to its other competitors and you will definitely find it satisfactory. It is possible to merge two videos together to make something unique out of it, but for that you have to use Kodak 360 PIXPRO software. Download this software from the official website of Kodak and it will provide you all directions regarding creation of expert videos that can be uploaded to YouTube directly. This software is actually much easier to use so beginners as well as professionals can take benefits of it; you will need only 4 to 5 minutes to stitch videos and create a customized content. Although this device is not able to capture the complete spherical image, the captured 4K videos are rated to be fine, clean with the proper color distribution. All camera controls are much easier to use and the authenticated desktop version of Kodak software allows you to create customized outputs from the captured ones. With all such amazing and assisting stuff, this camera cam be considered as a must buy product for your 360° imaging needs.